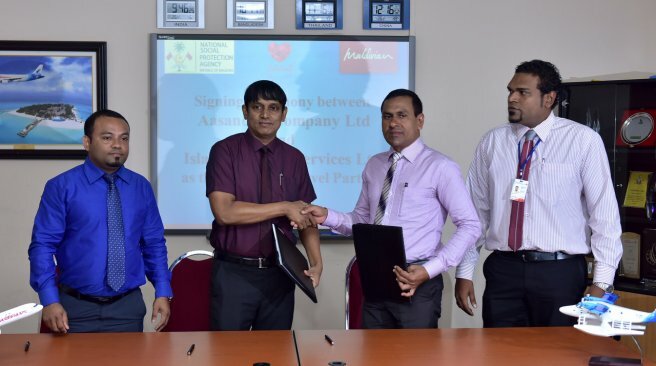 Maldivian, the national airline has signed an agreement with Assandha to carry passengers traveling to receive treatment under the national health insurance program. The purpose of this agreement is to manage all travel under the Assandha insuarance at one place. . All domestic travel will be managed by the airline directly while tickets from other airlines will be arranged by our travel department Maldivian Holidays. Maumoon Abdul Samad signed on behalf of Aasandha on the agreement today at the ceremony held at our Head Office of Island Aviation while our Managing Director Abdul Haris signed the same on behalf of the airline.